… but I do ignore her talking to herself or the tv. But sometimes I miss something important thinking she is just talking to tv. Getting someones attention before asking the important stuff is all it takes. Each time you realize that you missed the start of a sentence you just strike your left HA and it replays the recording of the last 5 seconds. (As soon as you strike your right HA there is a fast-forward feature to skip the most unimportant rubbish between the first and last word, very useful at bulls…t-bingo during office meetings). I’m sorry for posting this idea here, it does not help the OP. But maybe anyone has some direct connections to any HA manufacturer? This idea is public domain. Bonus points if you can adjust the volume and tone on playback to clarify the speech. Even more bonus if the aids log your preference so your hearing professional has some guidance on how to adjust. 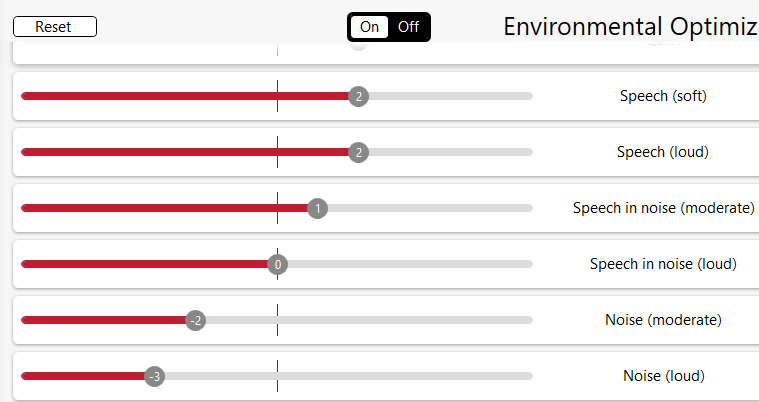 An interesting feature of ReSound premium hearing aids is the Environmental Optimizer feature, which they refer to as “automatic volume control.” The Optimizer function would typically be running most of the time if you are using the All-Around user program intended for general use all the time, letting the HA’s decide the best settings for volume, directionality, noise reduction, etc. This feature might actually affect the ability to recognize the beginnings of soft speech if you suddenly change between environments. I think I’ve experienced it myself: a while back I entered Gold’s Gym from a noisy parking lot. Just as I entered, the soft-spoken person at the front desk spoke to me and the person’s voice was very muted, then in a few seconds his normal voice volume in my HA’s. I was wearing very occlusive domes. As you can see, my problem may well have arisen because I was transitioning between a pure noise environment of Noise (loud) or Noise (moderate) set at -3 to -2 dB below normal sound volume (to lessen noise impact) to a Speech (soft) environment where the volume should be +2 dB above my normal sound setting. But according to the lecturer’s comment, this transition is going to take 4 to 5 seconds, so I was probably trapped at trying to capture the beginnings of someone’s soft speech by remaining at a suboptimal -3 dB volume setting that works great just for reducing the impact of loud noise by itself. Hopefully as HA’s keep gaining processing power, the time required for such environmental switches will drop below the level of human perception and perhaps the time differential required for major volume changes is just a quirk of ReSound HA’s alone? I’m a rookie in the HA area, so take this as such. I do have issues with hearing my wife clearly and distinguishing what words she is really saying, especially when she speaks from another room. I’m trying to keep an open mind about it, and have not come to a final conclusion whether or not that is a good thing or bad thing ;). It seems to me that there are two dimensions to this issue. One is that the sound level is just too low to hear even with a HA. The other is that the overall sound level is OK, but the level in specific frequencies is too low. I believe that is the common situation in age related hearing loss. If the level is just too low, then perhaps the noise reduction algorithm used is to blame. Or the compression needs to be increased by bringing up the low level amplitude sounds. But if it is only certain words and letter sounds, then it would seem to be more likely to be a frequency equalization issue. 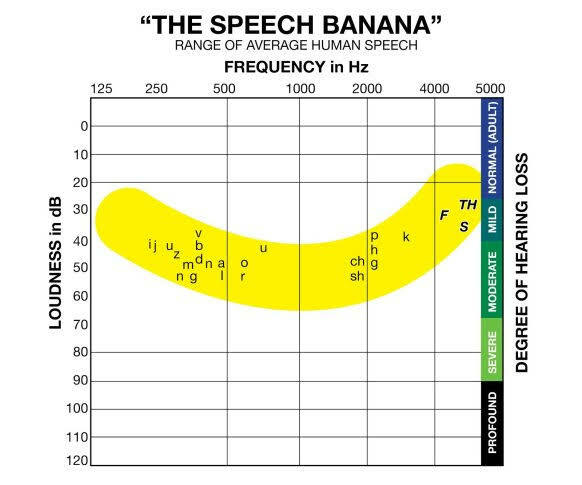 It might be worthwhile to keep track of what word sounds give you the most trouble, and match them to the frequencies shown on this “Speech-Banana”. That could point you toward what frequencies may not be properly corrected. And as a last resort I gather some of these HAs can be set to frequency shift down if the higher frequencies cannot be corrected enough. Seems to me that would be a last resort thing. Speech Banana is from this article on common words that are hard to understand. basically doing same but different in presentation diagram etc and implementation differ like resound 1 to10db oticon 1 to 9 and soft 1 to 3 signia 5 step 1to5 to 12to 24 etc. but remember one thing as you levelup NR it will also cut speech when you can not seprate noise source from speech. that include distance speech since low frequency noise will mix up in speech. and in such situation better to give microphone to wife. It seems to me that there are two dimensions to this issue. The dimensions that you point out are important but it seems more complicated than that. For example, just how open or closed your fit is can influence speech intelligibility to a certain extent - it’s theorized that sound bypassing your HA mics and going straight to your ear drum in a more open fit, say when you have good low-frequency hearing, with the right acoustics in your ear canal can interfere and cancel out at some of the sound frequencies produced in your ear by the HA receivers. And no matter what the problems of the listener, some speakers just don’t speak optimally, introducing doubt into what was said at the very origins of the speech! (post-nasal drip from a speaker suffering “cedar fever” allergy, for example - hard for an HA to program that out!). Hearing aids have a shorter distance limitation than the natural ear. Train your wife to come to where you are if she wants to talk to you, and likewise go to where she is before you talk to her. I have been very lucky with my new OPN1s that I can normally hear my wife in the other room which is behind me. This is something that I had not been able to do for over 15 years. Whenever I don’t respond to my wife’s commands she believes I have understood what she was telling. And complains she had told this or that to me. Yes, she did it but she did not check for an ACK. The information was lost on the WAY to my ears not within my brain. Whenever I ask her to repeat she asks me to come over because she is in hurry or the cat (or her notebook, etc.) lays on her legs. (Of course these situations are not always the case. Most of the time I can figure out what was ment). How am I able to successfully train her without getting the risk of poisoned conversation? I was able to train both of my kids. They even start EVERY conversation by first saying “Dad” to me and wait until they have my full attention. Have a serious sit-down conversation about what your hearing loss is like for you. Talk to her about how it makes you feel that she seems to have no interest in attempting these considerations for you. Let her know that you do not ignore her and you want to hear what she says. Acknowledge that it is difficult to change habits and try to get her involved in coming up with solutions as well. Can’t argue with cat advantage, though. If there’s a cat on the lap, what else can you do but sit there and pet it? Yes, always a great idea to bring your loved ones in to your appointments. I would guess that most providers are more than willing to talk to loved ones about this stuff, and sometimes it works better for it to come from the professional. My problem exactly, though the cat’s always on my lap! Maybe also turning Dani’s hearing situation with his wife into a win-win situation would be the best way to go about it. Find a way to reward her for paying more attention to your needs so she gets more positive feedback when she makes the extra effort to consider your needs. Hm, this is difficult to implement. But it’s probably the best and most durable solution. I’m testing a program that is essentially a duplicate of the AutoSense 3.0 calm situation program, and have made the directionality significantly more like Omni. Not 100% Omni. Phonak uses a scale for the calm situation program: 0 being Omni and 8 being fixed directionality. 4 being “real ear”. I set mine at 1. It still technically calls this “real ear” but the aid acts more Omni than not. Just last night my wife was not feeling well and was speaking impressively softly. My most challenging environment nowadays. She basically whispers (not quite but close) at times when the pains and changes of pregnancy flare up. I only asked her to repeat herself once or twice over the span of 1.5 hours, which is a big improvement. Do you know what kind of settings you have for Sound Recover 2? Just looking at your audiogram I wouldn’t have guessed it would have been a big help, but I’ve read it can be helpful even with losses like yours. Don’t know if you have the Quattro’s still to test in comparison but I guess one way to “retest” with another system whether omnidirectionality and frequency shifting help with soft speech in quiet (and a generally useful tip rather than something more specific to Marvel technology workings) would be to see if similar changes also improve soft speech recognition for the Quattro’s. Even if the Marvels were still better, that might motivate other HA users, where applicable, to try your changes if they felt their situation, hearing loss characteristics, etc., somewhat mirrored yours. Congratulations to you and your wife on the kid! If it’s numero uno, that will certainly be a big change in your lives! BTW, one very interesting thing that I learned from starting to read Harvey DIllon’s book on Hearing Aids (2nd ed.) is that noise coming from a different direction than speech can interfere more with recognition than noise coming from the same direction. Bottom of page 6, right column: "The deficit in SNR experienced by hearing-impaired people is much greater when target speech and the competing sounds are spatially separated (i.e. the usual real-life conditions) than when they all come from the same direction, or when they are presented through headphones (i.e. usual test conditions in the clinic). This deficit, which occurs even when sounds are made comfortably audible by individually prescribed amplification, is referred to as spatial processing disorder… " I guess this disorder is CNS-related and doesn’t occur in everyone but in part because of it, that would be part of the argument of the benefits of directionality in focusing on speech from a certain direction. So it’s interesting that omnidirectionality works better for you, relative to that possible context for more directionality in focusing on difficult to recognize speech. Ignorant thought is that I wonder if secondary reflections from elsewhere in the room could be helpful in identifying speech and that’s why omnidirectional seems to work better for you than directional - you pull in more short-delay secondary reflections, which reinforces the sound volume/characteristics? I have SoundRecover2 set to 19 of 20, which means its cut off is 5.8KHz and there is then frequency compression between 4.6 KHz and 5.8 KHz. If I understand it correctly. Also, audibility is set to highest amount of clarity, as opposed to comfort. Takeaway: maybe ReSound Quattro is not the best aid for those who are profoundly impaired, at least in comparison to Marvels. I don’t even think my audiologist is aware of the limitation of their ultra power receivers – this datapoint was really hard to find. For me, their marketing of 9.5Khz expanded dynamic range is a bunch of crap, and just a marketing ploy. In other words, this only applies to those with moderate losses at best. The images/diagrams they show in the professional’s brochure is not an easy or obvious read, it is only in this data sheet that the actual range is listed. Shame on ReSound here. I think this difference in receiver ability has made a significant change for me and speech clarity. I still have the Quattros to test. My audi and I did play around with Sound Shaper as well as omni / less directionality in the All Around program, but it didn’t help much. Cue the above limitations of the ultra power receivers. I prefer “real ear” and less omni in normal day life, but I’m finding that when set to more fixed directionality the hearing aids sometimes don’t realize it needs to “hone in” on her voice because she’s speaking so softly. Another issue that I have run across is when I am in the back room of our office charting on patients, and a doctor behind me (talking towards his computer, again, behind me) starts asking me a question about X Y or Z - it’s so difficult. I am hoping that this more “omni” feel allows me access to hearing in these situations. I just made the change very recently, so we will see if this helps. I may keep my auto mode as the “real ear” (mix of omni/directionality default) and slip into this environment when I start having trouble in quiet environments. To be determined! And thanks, we’re very excited to become parents!